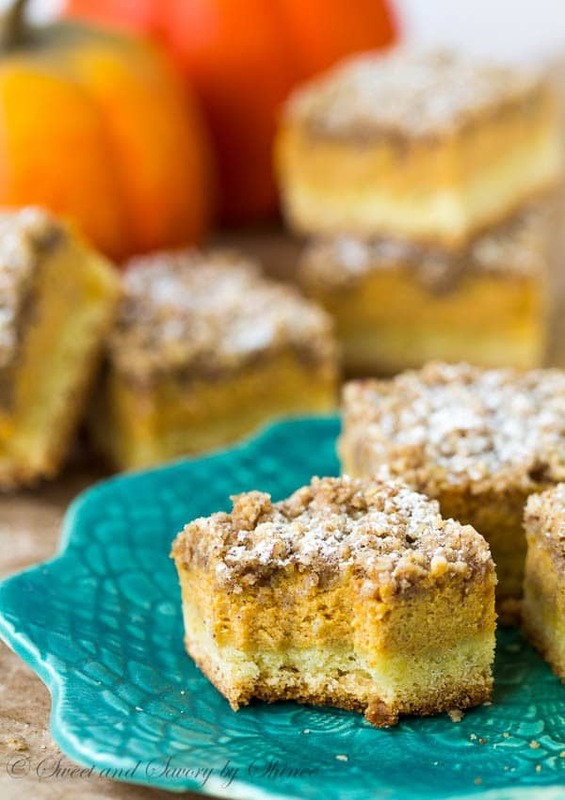 3 incredible layers of tender cake crust, smooth and creamy pumpkin filling and crumbly, buttery streusel topping make these pumpkin streusel bars out-of-this-world delicious! I made these incredibly delicious pumpkin bars a few times during last 2 weeks and each time they disappeared in no time. Seriously, my husband and in-laws were complimenting me how tasty they were, not once, but a few times. And I’m not even surprised, cuz they really are amazing. First, we have tender cake crust to provide nice and sturdy foundation. Then a layer of smooth, creamy pumpkin filling. Not to be confused with cheesecake filling, this pumpkin layer is almost mousse-like. Light and pumpkin-y! And finally, finished with a buttery, crumbly streusel topping. 2 ways you can prepare the topping. Either, pulse everything in a food processor for almost-fine streusel topping. Or, you can reserve half of nuts and rolled oats, and mix them in after you incorporate the butter into the topping to create more texture. I love it either way, so it just depends how much texture you want in your bars. Oh, it might look like a lot of ingredients. Fear not, most of them are spices, like cinnamon, nutmeg, etc. Speaking of nutmeg, I’m a bit obsessed with whole nutmeg and grating it fresh for baking. And let me tell ya, you can totally taste the difference (and no, not because of its hallucinogenic properties! 🙂 ). Freshly grated nutmeg is stronger and more aromatic. It’s just SO good! I had to toss the ground nutmeg once I tried the fresh stuff. I keep a few nutmeg seeds in a small jar and grate it on a microplane grater as needed. Try it! 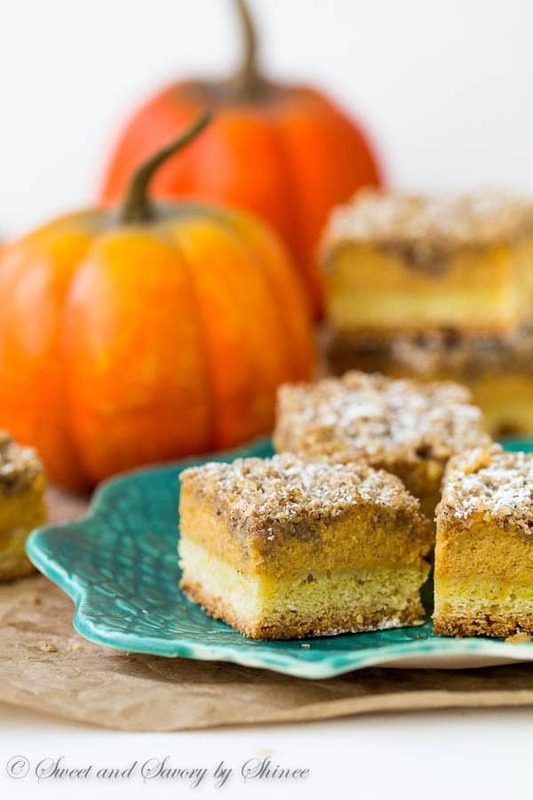 Yeah, these pumpkin streusel bars pair so well with pumpkin spice tea, as I had shared on Wednesday (did you see that fun tea party idea?). But you can never go wrong enjoying it with a cup of coffee, of course. Hope you make these bars this weekend. Wish you a wonderful weekend ahead. 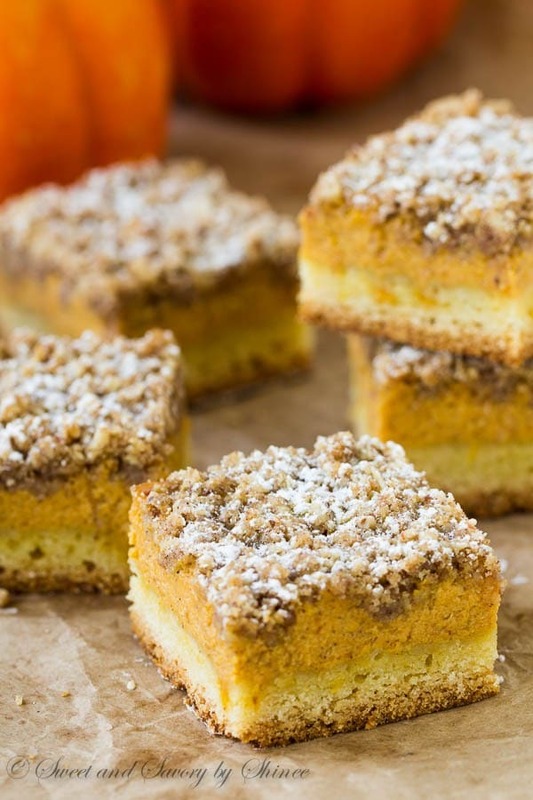 3 incredible layers of cake crust, smooth and creamy pumpkin filling and crumbly. 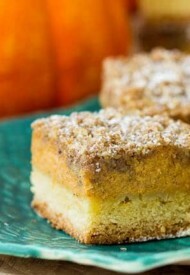 buttery streusel topping make these pumpkin streusel bars out-of-this-world delicious! Preheat the oven to 350°F (175°C). Line 8×11.5-inch (20x 29cm) baking pan with a parchment paper. 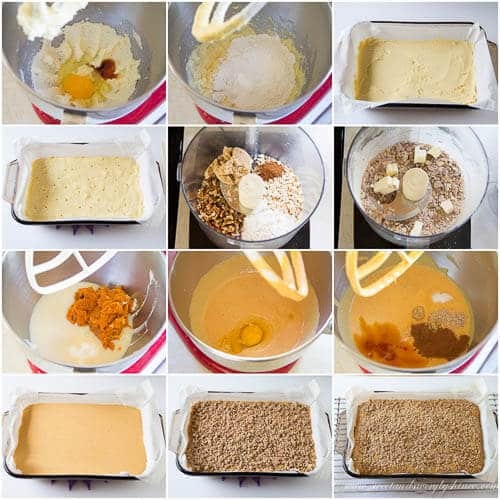 To make the cake base, in a mixing bowl with paddle attachment, beat the butter and sugar on medium speed until fluffy. Add the egg and vanilla extract and continue to beat until smooth. Add flour, baking powder and salt and mix until just combined. Put the batter into the prepared baking pan and spread it evenly with an offset spatula. Bake for 15 minutes. Meanwhile, make the streusel. In a medium bowl, combine pecans, flour, brown sugar and cinnamon. Add cold butter cubes and rub into the dry ingredients until crumbly. Put it in the freezer. To make the filling, in a mixing bowl with paddle attachment, beat the Greek yogurt, pumpkin puree and sweetened condensed milk on medium high speed until smooth. Reduce the speed to low and add the eggs one at a time, beating the mixture after each addition. Stir in vanilla extract, cinnamon, nutmeg, ginger and salt. Poke small holes all over the cake layer, if you wish. It’s not necessary, but it does help infuse the cake layer with pumpkin flavor. Pour the pumpkin mixture over the warm crust. Spread the streusel topping evenly over the pumpkin filling. Bake for about 40 minutes, or until the edges of the topping are nice and brown and the center is set. Cool on wire rack for about an hour. Then transfer into the fridge for couple more hours, or overnight, to set completely. When ready to serve, remove from the pan and cut into 12-16 squares. Dust with powdered sugar, if desired.